Designed to be eaten with in two weeks, these delicious pickles are quick and oh so easy to make. Remember to allow the jars to cool for an hour before placing then in the fridge. Your pickles will be ready in two hours, best from two days and good for two to three weeks! Enjoy! This recipe makes about 4 1/2 cups, double the recipe according to how large your jars are, keeping in mind that they will be filled with vegetables. Excess pickling liquid can be reserved for the next batch. 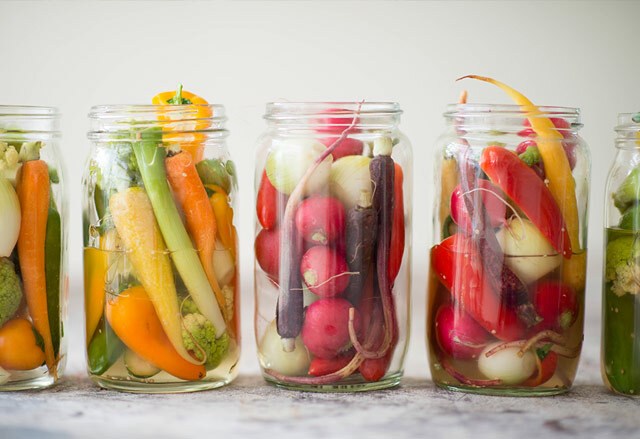 Place trimmed and sliced vegetables in to your glass jars and set aside. Make sure they are well packed so no more vegetables can squeeze in. Bring salt, sugar, vinegar and water to the boil, stirring occasionally. Reduce heat to medium and simmer for 10 minutes before removing from the heat. Place the vinegar mixture into a large jug then pour the mixture over the vegetables until the liquid nearly reaches the top of the jar. Place the spices and flavourings in the jars, then seal and shake gently to disperse the spices evenly. Allow jars to cool before placing them in the fridge, placing hot jars in a cold fridge may cause the jars to crack. Chill for at least 2 hours, for the full effect of the pickling chill for at least 48 hours. Vegetables will keep refrigerated for about 3-4 weeks. Try using other vegetables such as zucchini, cauliflower, beetroot, parsnip, turnips, radish, cucumber, or any other firmer vegetables. Flavour your jars with your favourite spice combinations and blends, i.e. jalapeño, dill seed, fenugreek, fresh ginger slices, galangal slices, celery seeds, whole cloves, cumin seeds, star anise, fresh herbs etc. Combine first all ingredients except the peaches in a large saucepan; bring to a boil. Boil for 2 minutes, stirring until sugar dissolves. Remove from heat and stand for about 10 minutes, you don’t want the mixture to be too hot. Cut each peach into 12 wedges. Add peaches to vinegar mixture; let stand 20 minutes. Place peaches into sterilised jars. Serve in salads or as a dessert with mascarpone and basil leaves or with roasted meats!